Cloud deployment momentum as enabled by software-defined infrastructure (SDI) strategies was clear at last week’s Intel Cloud Day. This event brought together key infrastructure providers and global business leaders who are capitalizing on cloud solutions. The day kicked off with a keynote by Diane Bryant, senior vice president and general manager of Intel’s Data Center Group, plus other Intel executives, who highlighted how Intel is driving the adoption of SDI and cloud computing solutions. Diane pointed to gains from the Intel® Cloud for All initiative that is focused on accelerating cloud deployments by bringing feature-rich, easy-to-deploy solutions to market. Via this initiative, Intel is investing in the cloud orchestration software stack, optimizing hardware-software stacks with our partners, and working with a broad community to align the industry around standards and standard frameworks to help avoid the fragmentation that can come with a fast-growing new industry. For details on these ongoing efforts, see the blog post Cloud for All Industry Collaborations Surge at Cloud Day, by Jonathan Donaldson, vice president of the Software Defined Infrastructure Group at Intel. The keynote was followed by a series of truly compelling “Ten Talks” from a worldwide group of industry leaders who are developing leading-edge private and hybrid cloud deployments. These talks featured representatives of Oregon Health & Science University, Johnson & Johnson, Commonwealth Bank of Australia, Sweden’s Umeå University, and the Massachusetts Open Cloud. 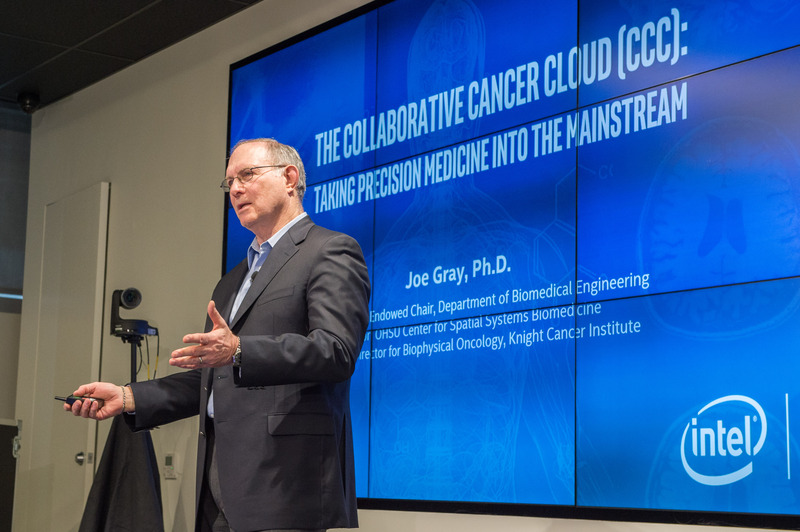 Among the highlights of the Ten Talks, Dr. Joe Gray, the Gordon Moore Endowed Chair of Biomedical Engineering at Oregon Health & Science University, announced two new participants in the Collaborative Cancer Cloud (CCC): Dana-Farber Cancer Institute and Ontario Institute for Cancer Research. The CCC is a distributed precision medicine analytics platform that leverages Intel technology to enable users to securely share and analyze huge amounts of data while preserving the privacy and security of the patient data stored at each site. Daniel Zelem, CTO at Johnson & Johnson, highlighted the bold steps his company has taken to move from traditional IT to software-defined data centers and hybrid clouds. He noted that their sweeping IT transformation is helping the company stay ahead of the “ever-increasing, exponential pace of change” and evolve from a healthcare product-based company to a product and technology company in the healthcare space. Examples like these really shine a light on the potential of cloud infrastructure to transform industries and drive new levels of agility, efficiency, and competitiveness. Let’s continue the conversation about how your organization can benefit from the agility, efficiency, and control of your own cloud at intel.com/cloudforall.